Often, very cheap, basic little city cars have problems with status. They’re perceived as little rolling penalty boxes, an added insult to the need for frugality. That’s why Tata’s well-designed Nano sold slower than it was expected to — few people want to be seen in what’s known as a “cheap” car. But there does seem to be a way around that, and this little Brazilian car I think has figured it out. 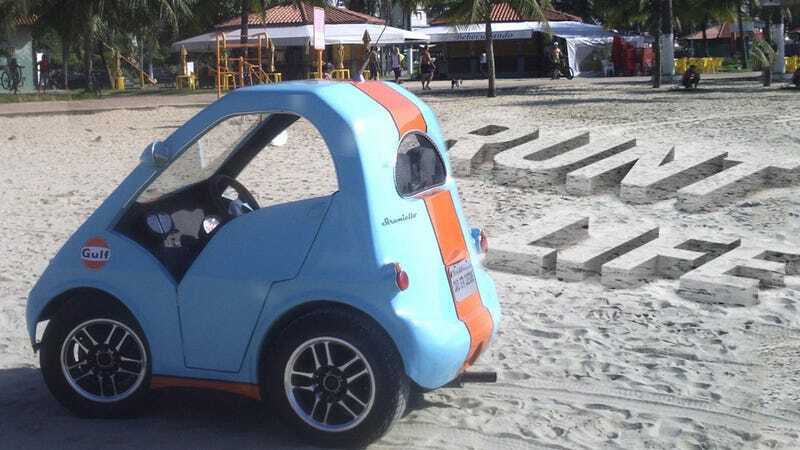 The car is called the Nanico, which is Portuguese for “runt.” It’s about as basic and minimal as you can get, a little two-seat city car with a 125cc scooter motor (an electric version is coming) that makes about 12 horsepower. Plus, it appears to be mid-engined! It only costs about U.S. $5,000 new, and it gets an honest 70 MPG. But here’s what I think makes it special: it has a sense of humor. The entire design of the car is exaggerated and cartoonish, and I think that’s great. I love the insane cut-down doors and the quaint, tiny oval rear window. There’s hints of modern cars in the front, and vintage Fuscas and Fiats at the rear, and Dr. Seuss on the sides. Nothing about the car takes itself too seriously — the racing stripes give it a hilarious unfounded bravado, and the tiny size makes it approachable. All of this together I think mean it can side-step the usual status stigmas that come with a car like this. Plus, it’s currently the smallest car for sale in Brazil, and as a result it’s great for São Paulo’s crazy traffic and parking problems. For the electric version, they’re even planning to sell the car with a set of solar panels that should be able to recharge the car in six to eight hours. So far, about 15 of the gas-powered Nanicos have been built by designer Caio Strumiello and his physicist partner, Paulo Roberto. Full production of both gas and electric models is expected to start next year, with the the Brazilian state of Ceara donating 30 acres for a port-adjacent plant to actually build the cars starting next year. It’s easy to see the practical value of small, non-polluting city cars to a city like São Paulo, but I think the real lesson here that any manufacturer can take away is that a frugal tiny car can be fun. If you have to be cheap, you may as well have a good time with it, and for a car I can’t think of a better way than to have wildly inappropriate racecar livery and go-kart handling. I’m excited to see what comes with this, and, Nanico folks, I’m available for your press launch — I want to try out one of these little kooks.